Apple’s always had a bit of an… issue when it comes to pricing. That is to say, they release new models that are just SLIGHTLY more expensive than the actual performance really justifies, and then they let the hardware stagnate for a couple of years while the pricing stays the same, which makes them outrageously expensive for what you’re getting, and then they refresh their product line and they’re reasonably priced for a few months. The take-away is that you should buy a Mac only just after a refresh, and that’s the pattern I’ve been following since I took my first slug of Kupertino Kool-Aid back in 2006 with the purchase of a CoreDuo Mini. I followed it up with the at-the-time brand new Macbook Pro 13″ in 2009 and now again with this 2012 i7 Mini. 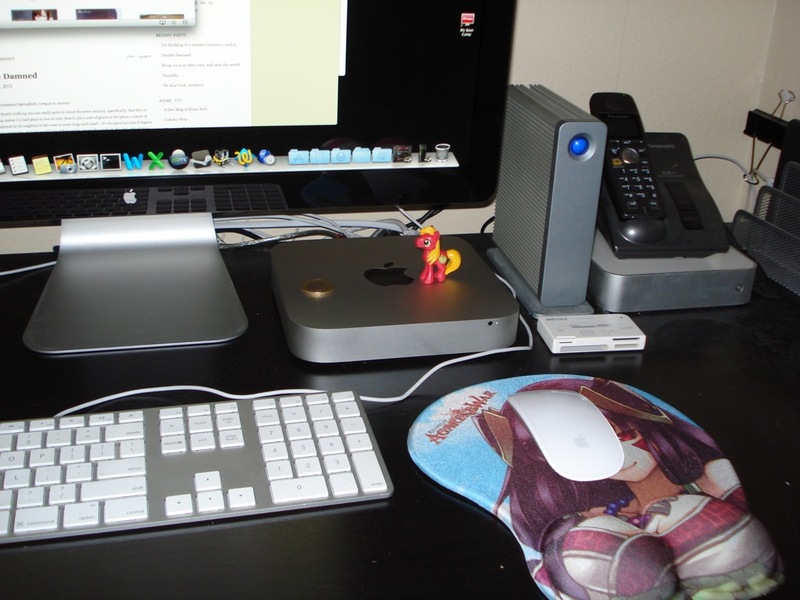 Why, yes, that IS a “Big Macintosh” sitting on my new little Macintosh. For some reason, while Apple was dropping perfectly good connectivity options like Firewire and microphone input from the new iMac line, they kept them on the Mini, managed to shove a quad-core processor in there, squeezed out space for a second hard drive if I want to put one in later and kept the price at the same as the old model. They cut corners a little bit on the GPU, mind you – it’s only got Intel 4000 integrated graphics. Still, that’s good enough to play Killing Floor at a decent frame rate so I think I can live with it. I’ve also tried a little bit of gaming in Boot Camp. Well, OK, I launched EQ2 and ran around a town for a little bit. It worked out nicely, even at 2560×1440, but EQ2 is a terribly CPU-bound game that doesn’t really need much GPU oomph to get going, so it’s really playing to this thing’s strengths. Video encoding is also quite snappy. The AMD 6-core beast still beats it out by about 20%, but that’s what two more cores will get you. Now, I loved my Macbook – it has a fantastic screen and the best trackpad EVAR – but since I’ve graduated college it’s been living a permanently-docked existence. With the new Mini, I get to pass it down to my wife and everyone gets a new toy. This entry was posted in mac, mlp:fim. Bookmark the permalink.